Last year I lost my Ivanhoe, who succumbed to FIP (feline infectious peritonitis) just 11 months old. 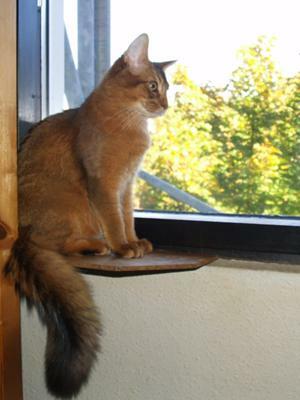 He was a purebred Somali that I had high expectations for - both show-wise and as an affectionate companion. This wonderful cat deserves his own page, so at a later date I'll tell you about the happier moments over in the Somali section. When Ivanhoe had just passed 10 months he started losing weight. He also got more weary and less playful. I took him to the vet and a blood test showed anemia. A number of possible diseases were discussed - ranging from simple infections to more grim options like FIP. We decided to start treating with antibiotics, but at the same time send a blood sample to an expert lab for a more thorough check. When the results came back, the blood values ruled out most of the other possible diseases. They did not rule out FIP, but there is no conclusive test for diagnosing FIP at the moment and blood tests will only indicate the possibility of the disease. I have a good vet, whom I trust and I sensed she was worried about the situation too, but we decided to carry on with the antibiotics as Ivanhoe seemed to get slightly better from it. Sadly this improvement lasted only a short while and a couple of weeks later it was obvious that something was very seriously wrong, as Ivanhoe kept losing weight and also seemed short of breath. Forgive me for not describing his condition in more detail, but even more than a year later it's too heart-rending. Since about everything else had been ruled out by now, I had to accept the fact that most likely Ivanhoe suffered from deadly FIP. On the suggestion of the breeder, with whom I had been talking things over all the way, I decided to get a second opinion from the breeders vet. Not that I distrusted my own vet, but I could not have this loving cat euthanized unless I was absolutely certain. We took him there and they too studied the test results without arriving at a final diagnose. He was then X-rayed - and then there was no doubt about it anymore. Most of his chest cavity was filled with liquid typical of wet FIP in a progressed state. No wonder he was short of breath, but cats have this way of hiding their weaknesses, so he never revealed how bad his physical state had become. I was of course there at the clinic all the way calming and caressing him until he was finally put to sleep. It was all very peaceful and when it was all over, I sat there for a while remembering what a good cat he had been. He looked just as if asleep. Not so many years ago entire catteries were extinguished if one of the cats carried the Coronavirus, because back then many believed that Coronavirus meant FIP. It's not so, although there is a clear connection. For most cats the virus is harmless and they'll never get the disease, but in a few cases it will mutate into FIP. A Danish study suggests that less than 1% of the infected cats develop the disease, but the remaining more than 99% don't, so there's no need to panic about it. Whether my Ivanhove brought the Coronavirus with him from the small cattery where he was born or whether he contracted it in his new home from our old cat, we'll never know. It doesn't really matter either, because the risk of the virus mutating into FIP is so minimal. For now we'll all have to live with that risk until the kittens reach 1½ years, but hopefully some day there will be a vaccine and maybe even a cure. Its certainly sad to hear about the loss of your cat but im sure she's at peace now. My cat also suffered from FIP. At first the vet said that she had pancreatitis. She was under fluid treatment and antibiotics injection for like 2 weeks. After two weeks, her condition got worse, no appetite at all and seem to be lethargic most of the time. Her breathing pattern is also irregular. I also noticed that she had a bloated belly and suffered abdominal pain. I got a second opinion from another vet and she confirmed that its the deadly FIP disease. I was totally crushed. Thats when i decide to put her to sleep on the 14th April 2012. For i love her so much that i don't want to see her suffer. May my 108 be a peace. Hi Marima. I am so sorry to hear about your loss. FIP is a terrible disease and although the pain of losing a wonderful young cat will fade over time, it never leaves you completely. Although it's been four years now, I still think of my Ivanhoe each and every day and that's OK because - As long as we remember, they will be here with us. Hi, I'm so sad for your loss of cats and kittens. I'm currently going through something which sounds frighteningly similar. I have had my kitten chad 2 weeks, and got him at 8 weeks old,he had a slightly chubby tummy, but this has grown and now looks huge. I took him to the vets last week, who thought it may be worms, as couldn't feel anything untowards. He is very playful, eating and drinking fine, weeing ok, has a litle difficulty pooing(cries when he wants to have one), and normally poos only once a day. My sister got his brother, and his belly was also chubby when she first got him, but his has now gone to anormal size. The vet gave Chad half a worming tablet(he is so tiny), and told me to give himthe other half in another two weeks, and to take him bak in 4 weeks. I'm terrified he has FIP. When he eats his belly looks as though it has grown, but then he when he poos, it doesn,t seem to go down much. I have even paid on line vet for advice this morning, and they said it didn't nsound like FIP, but could just be a large amount of worms, but haven't seem anything in his poo. I have lost 2 other kittens in last 3 years, both got ran over, and broke my heart, don't feel I can lose another one. Please can anyone shed some light on my situation. I just want a straight answer. Does it sound like my kitten has FIP or may it be constipation. I don't think I should wait another week to give him his other worming tablet, and just insist the vet gives him a scan? Hi. Sorry for not responding earlier. I have a feeling that as you read this, you probably already have had to say goodbye to your Smurf. All I can say is that I feel so sorry for you, but I'm sure you have made the right decision. One thing about Ivanhoe's final weeks that still disturbs me is that cats are so clever at concealing pain. The amount of fluids within him that I saw on the Xray must indeed have caused him a lot of pain, just as it affected his breathing. Hello, I'm very sorry to read what you went through. I am going through the same thing right now and am faced with the issue of trying to determine if it is time for my little 'Smurf' to leave us today. None the less - even though he is a little fighter, i feel it may be time to say good-bye at some stage today. My dilemma comes from not knowing for sure if he is in pain or not. I just want him to be comfortable. He seems ok at a glance but if you look deep into his eyes, it's easy to second guess that. He is only 14mths old!! What a waste of a magnificent life that has not only blessed the hearts and brightened the lives of all around him - but he has successfully done what no other animal could do before, and that was to win the heart of his best buddy, Yoda. I hope that one day we can find a cure for this heart-wrenching disease. My love goes out to all animals, and animal owners that will ever be put in this horrible position some day. Just remember to stay strong. Hi there, unfortunately we had to face the inevitable and have wee Hattie put to sleep 2 weeks ago. The vet said the test results were inconclusive, but if not FIP is was something equally as awful and we had done the best thing in the end. We last a week cat-less and have since got a 16wk old Brown Burmese male called Solo. He's lovely and very playful like most kittens. He will never replace my other cats but we will enjoy watching him grow. Hi Anonymous. I'm so sorry to hear about your loss, but don't blame yourself, because there is no way you could have watched your kitten 24-7. She is freed from all the suffering and pain now. Many find comfort in the belief that we shall meet our beloved cats again at the other side of the Rainbow Bridge. https://pictures-of-cats.org/rainbow-bridge-poem.html And I believe that as long as we remember them, they will still be with us. Hi Corinne. Sorry for not replying earlier. I hope your Hattie recovered from her illness, but if not, please accept my deepest sympathies. FIP is such a cruel disease because it is so hard to diagnose. Actually this is mainly done by ruling out all other possible explanations to the symptoms. This process takes time and while you see your cat get worse, you go through an array of hope, powerlessness and despair. If the Vet finally arrives at the terrible conclusion that it is FIP, at least we know that we have done all that can be done. But still, it's a terrible moment. I just lost my 6 mo old kitten to FIP. In less than a week, she became so week. We were shocked and were planning to have her euthanized that following week. I came home from work and couldn't find her. I finally found her beside the bed with the little paw caught in the hamper. It looked like she was trying to jump down and was so weak she fell. She was paralyzed. It was the worst day, I called my husband at work and we took her to an emergency vet to put her down. I'm still having nightmares of her just laying there because I wasn't home. I worry so much that she hurt herself hours before I came home, wondering why I wasn't there to take care of her... If only I could have been home sooner, maybe it wouldn't have happened and she wouldn't have had such a painful death. I hope a cure is found soon, I worry about rescuing another kitten because I can't go through this again. May all of our beautiful kittens rest in peace and know that they were loved deeply. Came across your website by accident. Our old Tortie cat Matilda sadly died last October, she was a rescue cat and we had her for over 16 years. We had to have the vet put her to sleep. She was a great wee friend and I knew I would never replace her, I just couldn't bear not to have a cat about the place. We went to our local animal sanctuary and re-homed a 2yr old Tabby who we named Hattie. She made herself completely at home, playing, sitting up at the window, and sleeping on our bed!! She then started sleeping a lot and was off her food and rapidly losing weight. Our vet told us it looked very much like FIP. He ran tests, Xrays and took bloods and the prognosis is not good - we are just waiting to hear about the blood results. He gave her long-acting Antibiotics and anti-imflammatory injections whilst we wait for the rest of the results, it is awful watching this gorgeous bundle of furryness go down so rapidly and I have resigned myself to the inevitable. I may well get another cat in the future, but for now I'm going to remember the love and pleasure both my pussies gave me. Unfortunately we lost our little Marley Mo Mo to FIP. Worse was still to come ,2 months later after a very courageous fight we lost his pal, Kabool. Both kittens were bought from the same breeder who strongly disagreed with the vet that the kittens had FIP. Kabool was a lovely wee chap,he was chatty and still loved to watch the birds from his window seat and fought to the end. We had the best vet in the world and she was heartbroken when we had to make the decision to let Kabool join Marley. Utterly heartbroken. Although all the classic sighns were there, only a post mortem can give confirm FIP. I have kept an eye on the breeders web site and she stopped breeding for approximately 7 months. She now has a new Queen and is breeding again. We are now the owners of 2 more Bengal kittens and I am constantly watching for any signs. Sneezing is one sign !! We keep 2 litter trays and empty them daily and change the complete litter weekly. Having been through the horrible disease I feel for everyone who has lost their special furry friend. Hi Francesco. Sorry for missing your comment, which is why I haven't answered before. First of all I must express my deepest sympathies with your loss of Asia. FIP is a terrible disease that leaves no hope for recovery, so you did the right thing by having he put to sleep when the diagnosis was certain. Prolonged therapy would only have prolonged her suffering. Corona virus is not FIP, and there is absolutely no need for alarm just because you other cat is positive for the virus. Actually here in Denmark most cats living in multiple cat environments have it and I suppose it's the same in most other places. It is however only with a very small percentage of these carriers that the Corona virus mutates into FIP. Also the risk of FIP hitting cats above the age of 1½ year is virtually non-existant, so don't worry about your older cats. In case someday you want to breed kittens, you could of course take some special precautions to keep the free from the virus and the minimal risk of contracting FIP. Dr Diane D. Addie is a renowned expert on FIP and her website at www.dr-addie.com has a lot of very useful advice. But again - don't get too worried. It is a fatal disease, but only very few cats are struck by it. Hi Sarah. Hearing about your loss hurts me too. Losing a playful and lively young kitten to FIP like that seems so meaningless, but I'm glad to hear that you had her examined so thoroughly that there could be no doubt about the diagnosis. As long as there is any hope of a cure, that hope must be pursued, but when no more hope exists, we must do what is best for the cat and put it to rest. I am sure your little cat will stay in your memory forever, just as my brave Ivanhoe do. Allow your grief the space it needs and when you are ready, you should find another cat. Not as a replacement, because no two cats are the same, but because you are a cat person. Don't be too scared by this sad experience - after all the risk of FIP is minimal. The lifespan of humans is so much longer than that of cats, so we must enjoy every day we have with them. I just lost my 9 month old kitten to FIP last week. I am still heartbroken. We saw 3 different vets, it took two weeks to make the diagnosis. She was a cutie pie, and was so good with our other cat. We want to adopt again, but I am scared! 2 weeks ago I lost my little Asia, only 5 months old, for effusive fip, just 4 days after we had diagnosys. I decided not to try any therapy: she was already too sick after 2 weeks of antibiotics and basically already stopped eating. I read everywhere that any therapy is almost uneffective on very young cats and I didn't want to turn her last days into a torture. At least we knew of the disease very few days before her death... there would be anyway nothing to do for her. We are now worried about our other cat, Maia, 2 and 1/2 years old: she's also FCoV+. Does anyone have direct experience in multicat enviroment, whith one of them gone for fip? shall I be really worried for her? will I ever have the chance of getting another cat without putting him into highly dangerous situation? I had 2 FIP dry forms-reject cats from two airports (I was USDA Animal and Plant Health Insp. Service pre homeland stupidity when USDA split) and so customs and the airport jocks dumped cats on me. I used to do quarantine in my office then to q in my rec room then adopting when I could, and add to the pack when I could not find parents. I had 2 kittens who lasted pretty well (after initial transfusion - 4+ yrs) and had a pretty good quality of life during their time with daily pregnsone/erythro or other antibiotic. They had KD, CD or Special Digestion to help with GI problems. It is impossible to tell on immune destruction of marrow so be warned it can go to marrow. Customs Buzzer only had a snuffly nose for 4 days before I found his hemo was to 4 (normal 29-45) and white blood cell was 0. If it was infectious-it ought to have gone to my geriatric pack (18, 19 or 21) but never did. Pudge was over 21 and 5 years with FIP cats-when she went. Please do not grieve too much-we can only do the best we can. Adopt another kitten who needs lots of help in the kittens memory. Hi LVL. I sympathise with you and your family from all of my heart. Losing an old cat is like losing part of the family history and now your new kitten too. With an old cat you have time to accept the thought that some day it will be gone, but with a young kitten you have hopes and expectations of many good years ahead. And then suddenly it's gone. Losing a kitten to FIP is indeed traumatic and even two years after I still think of my Ivanhoe each and every day. I also pity her brother, who apparently misses her. Active cats like Bengals need company, so please get her a companion soon. It doesn't have to be a Bengal - actually a completely different type of cat might be a good idea, so that it's not "a replacement", because that you'll never get. As to the financial side of you loss. Yes, that hurts too, but I can't say whether you are entitled to any compensation as it depends on the contract and the laws where you live. The standard contract used by Danish breeders is pretty strict on this and actually I can't blame them. If it wasn't that way, the breeders would have people come running for money years after the cats were sold. And with FIP being so hard to diagnose, things don't become any easier. As I have said, I don't blame Ivanhoe's breeder, not even if he contracted the corona virus with he, just as I would not have blamed her either if he had developed a deadly tumor. I believe these things just happen and my blaming does not bring the cat back. I know how you must feel now, but time is a healer and I hope you get over it. My best wishes to you too. Hi LVL. I'm very sorry to hear about your loss. The terrible thing about FIP is that it is an incurable disease and almost impossible to diagnose. We also sent blood samples to the German lab, but even their test can't say for sure that it is FIP. You arrive at that diagnose by ruling out all other possibilities and only once the cat has died it can be verified by examining the fluids inside it. I understand if you have a feeling of being let down by the breeder, but please remember that the cattery does not have FIP. It may have Corona virus present as very many (most?) multible cat groups do, but Corona virus is not FIP. In less than 1% of cases the Corona virus mutate into FIP - the remaining 99% don't. The cattery will of course be worried about it's reputation, but having a case of Corona virus is not that damaging after all. And since you have had the kitten tested negative for the virus early on in the proces, it can be argued that it did not have it when it left the cattery, but must have contracted it somewhere else. I'm not defending the breeder here, just trying to see things from both sides. At any rate a more open and sympathising attitude from the breeder would have been nice. Again, I'm sorry about this young cat and understand the helplessness you must feel. Life is sometimes very unfair. Jun 28, 2010 4 month old Bengal with FIP. We lost this morning our beautiful baby Bengal girl to this horrible disease. She was 4 months old and came with her brother from a reputable breeder about 1 month ago. At first, we thought her lethargy was due to the stress from the trip from the breeder, However as the days went by we noticed her belly getting bigger and she just didnt play and preferred to sit on our laps. She never really played as vigorously as her brother. After 1 week, we gave them both a de-worming medication, recommended by our vet, but after the 2nd week we saw her belly growing even faster. Our vet immediately diagnosed FIP. Our breeder insisted it was Coccidiosis, a curable parasite and not FIP. Needless to say, after other vet and series of emergency visits and tests we watched helplessly as her health waned in and out. All vets told us that FIP, but to be 100% sure (she tested negative for the corona virus, was eating healthy, no diarrhea) we needed the fluid to be diagnosed and tested in Germany. There is only one lab that can test 100% and we wanted to be sure. Yesterday she was on our balcony in the sun, eating, purring and we thought she was going to recover, but her belly was still big. This morning at 3 am we heard her crying, paralysed on the floor and we called the emergency vet. Her stomach had swelled up and she was put to sleep in our home by the vet. The virus seemed to have ravaged her overnight. Our breeder still insists that it was not FIP and we are devastated. Only an autopsy will prove otherwise or the test results from the lab in Germany. We will get the test results on Wednesday. Her brother is in great shape and seems not to have the virus. Although we only had her 1 month, I sympathize with all of you who have lost your kittens to this controversal disease. We did all we could do to save her. My only regret was to realize and accept earlier of her fate and make the decision not to let her suffer. Please do not listen to your breeders if they tell you that the kitten is in good health and try to derail you as we were in the hope that they will get better. I hope the breeders will be responsible now to realise that FIP is in their cattery and even though risk ruining their cattery's reputation, let the awareness out so that these kittens and their owners dont suffer a needless and painful end. Hi Kathy. From all I know this disease only hit kittens and young cats up to the age of 18 months. Some books say that FIP occur with old cats as well, but last year I attended a FIP-lecture by a Danish vet, who said he had never seen nor heard of confirmed cases of FIP with older cats. Mar 15, 2010 Eli- Does he or not? Not sure if Eli has this or not as he has been sick but just recently I am noticing his abdomen swelling a little. Sigh, he's only 4, and I got him from a shelter 2 years ago. Hi Lu. I'm very sorry to hear about your loss. There is really nothing to say, but sometimes life is so unfair. I think by going to three different vets you did all you could possibly do. FIP is indeed hard to dignose with certainty, but it seems to me that the vets maybe could have been more aware of symptons pointing in that direction. A thorough blood test will give some clues, although a conclusive diagnosis sometimes cannot be reached until the final stages of the disease. On the other hand some milder diseases show similar symptoms to early stage FIP and in order to cure them (or rule them out), they are treated with antibiotics. FIP is still incurable, but all these young cats cannot be put down just on a suspicion. As long as there is a slight chance of the disease being anything else, that hope must be pursued. Sadly your Jasper belonged to ones that did not make it. I pity him and know how you feel - this is something we never really get over. I had to have my Kitten Jasper but down last fri evening it was the most horrible experience i have been through. Fip was only diagnosed after, he was 8 moths old i had been to three different verts an no one could tell me what was wrong with him they run tests an just gave him antibiotics. Even though he was nine months he was sooo small for his age but he was the most loving and affectionate kitten ever and was my shadow, i wish i had found out about this disease sooner so i could have understood what he was going through. I haven't checked the comments on this page for a while, so I'm sorry for not responding before now. Elle - I'm so sorry to hear about your loss. I understand your feeling of having been lucky to have Georgie and would not have traded him for another. I too am grateful for every day I had with Ivanhoe. Robinsons - you have my deepest sympathies. FIP is difficult to diagnose conclusively, so I hope your Bengal kitten has contracted something less serious after all. Lynn - I feel your pain and sorrow. Yes, it's so very unfair when a young kitten has it's life stolen before time. And Jeanette - I'm very sorry reading about your loss too. I hope your other cat got over it? I personally have my doubts about homeopathy, but when no other hope is to be found, I understand why people go looking for new ways. I understand how you feel. We just lost our kitten to FIP. We got him on New Year's Eve. He was a perfect companion. Always purring, cuddling, and loving. He slept by our side every night and never left us when we were home. We were very attached. We thought we'd easily have 15 years with him. He woke up Valentine's Day unable to walk and that night he had a seizure. We didn't know what it was at the time. We thought he had just woken from a nightmare. The next day he was diagnosed with FIP. We brought him home sobbing and refused to let him go farther than an arm reach away. That night he suffered 7 more seizures and we took him to be at peace the following morning. He was barely 4 months old, and the knowledge he never had a chance screams viciously at us. Although devastated, he was wonderful and he made our lives better the short time he was with us. I was lucky to have him and, despite the pain, I would not have traded him to have a different, healthy kitten. Love you always, Georgie. I m sorry to hear of you losing your cat. We are about to lose are 5 month old bengal kitten, Marley Mo Mo to FIP. We are devastated by this infection and feel powerless. I too lost my lovely Siamese Max last month to FIP, within 1 week of him looking a bit off colour he was put to sleep. The affects of the FIP were devestating, he lost weight daily, his stomach bloated with fluid, he was dying right before my eyes. The fact he was under a year was so painful. I have lost cats in the past, but when your cat is old hes had a life and you are more ready for what will come. This cruel illness took poor Max in no time, it was so painful i cry as i write this. His life was stolen by FIP. Hi Michael. We also have a 15 year old Norwegian Forrest cat of own breed. She's been part of our family's life for so long that nobody remembers what it was before her. She was promoted to "First Cat of the House" eight years ago, when her "uncle" died and has gotten/taken herself a lot of privileges that other cats have not been granted. Yes, Finn, I agree completely. My girl cat is about 17 years old now. She is still pretty fit but I think quite a lot about how it will be without her and I always tell her I love her and will miss her when she has gone. It is a long time to be with a companion (the average marriage lasts 9 years in the UK!). So the preparation for parting is longer but perhaps the loss greater. Thank you both for your sympathy and thoughts. What made this really hard was that he was so young and alive - and then literally withered away in a few weeks. I've lost old cats too and know how attached you get with them over the years, but as the cat starts getting old at least you have a chance of preparing yourself for the inevitable. Still, it's never easy when the day comes. im very sorry for your loss, somalis are beautiful cats. I felt very sad when i read your story. It's hard to loose a loving pet. My cat is getting up in age and i dont even want to think about loosing him. Finn, thanks very much for sharing this although it is painful to read. I feel really sad for both of you. Take care and thanks for all your very useful and interesting contributions. Thanks Joanne for taking the time to share your sad story. My condolences. So sorry to read of his death. Could there be a connection of some sort between the dog attack and the FIP? This is in memory of my little Princess Mia today she lost her fight with this horrible virus. Princess Mia was only 6 month old she was rescued from a parking lot in Merced Califorina with her sister Princess Bella. She came to live with me and Faith on June 10th of 2012 she was the most sweetest kitty you would ever want. It has only been hours since she passed away and I feel that I will never get over it. I hope a cure will be found because the humans and other innocent kittens and cats should never have to go through this kind of heart felt pain. Saint Frances please protect and watch over all our fury companions. So sorry to hear of this. Good luck for the future. It is an awful disease and it is far too common as well.